melz world: Heaven! I'm in Heaven! Ok, not really, but I am REALLY stoked about Boca Burgers right now. I'm not a vegetarian, but since I've been on WW these products have been a lifesaver. I started using the ground "beef" last year, and it's great for two reasons: 1. It has WAY less fat than either ground beef or ground turkey, and 2. IT'S FULLY COOKED! That's right people, no thawing and browning for me. Not any more! I can come home from work, put a package in a pot of (jarred) spaghetti sauce or beans for chili, and have dinner on the table in a matter of minutes. Brilliant! Well, back in our (unhealthier) days, Jason and I ate our share of chicken patty sandwiches. Well, I don't think I have to tell you that those things are loaded with fat and calories. Well, Boca has come to my rescue yet again. They have these spicy chick'n (that's how they spell it) patties, with only about 160 calories and MUCH less fat. Pair them with a Whitewheat hamburger bun from Nature's Own, and we're in business. Even Jason agrees to eat them! Well, yesterday was the first time I'd tried one of their burgers. I've had the Gardenburger type (Portobello Mushroom - yum!) but never Boca. Last week I was in the store and I spied a box of the Boca Vegan Originals with a 75 cent off coupon, so I went for it. Besides, those are the kind Amanda eats, so I could share them with her for lunch one day. We had them yesterday for lunch, which was a good thing because she's been eating so many PB&J sandwiches lately she's afraid she's turning into one. (By the way, she IS a vegetarian, but she doesn't like many vegetables, so we sometimes have a bit of a problem). It was great! I had mine on one of those great buns with mustard, ketchup, pickle, red onion, and tomato. I even toasted the buns, which made them even better. Just two POINTS! I am so excited! So, count me in as one of the "soy people." I figure it can't hurt. I've even got some lite firm tofu, just waiting for Jason to find me a recipe to use. Thanks for commenting on my site - that was encouraging. 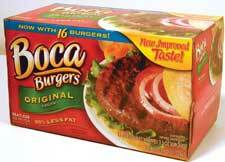 I'm also doing WW so I will have to try these Boca Burgers. Good Luck with new healthy ideas and keep passing them along. I used to eat those All American grilled Boca burgers, but they contain cheese and don't taste that much better. Not worth the additional fat and calories, if you ask me. My WW leader said don't get those with the cheese, because they aren't one POINT. I don't really see the point of the cheese, but then I never saw the point of a cheese-imbedded ground meat product. Or those cheesy hotdogs, for that matter. But I digress. Ohh, where did you buy them? I wonder if I could get my family to eat it. They look yummy. And you make it sound so good I'm hungry now. LOL. I really should check into this WW thing. Is there anything online or do you have to buy THE book? I think I just need a little bit of guidance. keep passing these tips along... love it. I got them at Super Walmart (there are only two grocery stores in our town, and the other doesn't sell Boca), but you could probably find them somewhere near you. I haven't tried the burgers on my husband or daughter yet, but they both eat the "Boca Crumbles" (ground stuff) just fine, and the chick'n patties too. You can do WW online, or go to meetings. As you can probably tell, I think it's great! Hey Melissa! My mom got some of he Boca Flame grilled burgers. My mom and I have started WW and have been on it about a week now, I love it. I feel so much better about the decisions I'm making on what I'm eating. My mom says the boca burgers are really good and the flame grilled ones are also. Al - that's great! I'm such a WW cheerleader - my publisher's wife started on Monday because of me! She even took me out to lunch on Monday before she went, so I could show her what I eat!